We reported last week that BMW intends to roll-out a new collection of Performance accessories for its M cars. And the one that got the most interest was the highly anticipate M Stripe package for the 1M. Originally rumored to be a throw-back design, the stripes clearly are a down-sized version of the same design that debuted earlier this spring on the M3. And while we didn ‘t care for them on the M3, we definitely don ‘t care for them on the 1M. Especially the small mistake portion that extends behind the rear tire. We get that it ‘s suppose to follow the natural line that most BMW ‘s have emphasizing the powerful rear wheel drive layout, but it simply looks awkward. The other accessories listed for the 1M (CF spoiler, mirrors and gloss black front grilles) are hold-overs from the standard 1 Series accessories that have been available for four years now. Official Release: The intriguing character of BMW M cars is further emphasised by the BMW M Performance range of accessories. These complement those available for the BMW M3 and include new products for the power train, the suspension, aerodynamics and the cockpit and have now been extended to include other models. Wing mirror covers and a rear spoiler are available for the BMW 1 Series M Coupe. These accessories are manufactured from carbon fibre reinforced plastic (CFRP), handmade by BMW. In addition, an eye-catching BMW M Performance kidney-shaped radiator grille is available in a black, high-gloss finish. 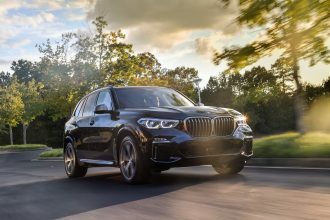 The BMW M Performance range of accessories for the BMW X5 M and the BMW X6 M allow the driver’s own distinctive personality to shine through. For both models, 21-inch BMW M Performance light alloy wheels in double- spoke design, a BMW M Performance carbon front splitter and a front grille in black are now available. In addition to the BMW M Performance rear spoiler and the BMW M Performance tail fins in black, model-specific BMW M Performance side skirts underline the dynamic elegance of the BMW X6 M. Perfect control and an authentic racing feel are provided by the BMW M Performance steering wheel, which is available for the BMW X5 M and the BMW X6 M. It has an Alcantara cover and a rim that is designed with a flat section at the bottom. In addition, it sports three-colour M stitching and a centre marker at the top in racing blue. The BMW M Performance range of accessories has now also been complemented by an attractive new innovation in the field of design. The BMW M Performance side stripes for the BMW 1 Series M Coupe, the BMW M3 Coupe, the BMW M3 Convertible, the BMW X5 M and the BMW X6 M refine the distinctive appearance of the BMW M, adding an exclusive sporty accent to the vehicle. Awful. And leave your 1M alone – seriously!! They messed up the stripes big time… rarely will I say that BMW completely blows something, but they definitely did this time. I tend to agree with you Michael, I think who ever was responsible for the stripe design forgot to look at the old CSL for inspiration, or for that matter the new batch of MotoGP safety cars. Maybe the modern trend is clean and conservative? Like the “hockey stick” stripes on the 2002 Turbo, or perhaps the flag decals on the E36 “lightweight”? Or more subtle? I hope that’s a photoshop. Don’t do it Gabe! I think they are better looking than the retro-70’s stripes introduced last week on the new 1 series car….the stripes that go over the hood / bonnet.